Another precious book came in the mail this week: Japanese Quilting by Yoko Saito . I had seen Yoko's work in magazines, but this collection of projects is a gem. Her signature taupe fabrics and wonky blocks adds whimsy and charm to her designs. Yoko's fabric colors appeals to traditional quilters, while her modern bag designs redefine this old staple of every woman's accessory arsenal. I am glad she incorporated Sashiko into some of her offerings, as I have fallen in love with this Japanese technique. Translated instructions provide all the guidance you will need, although at times it can make you chuckle (Lemon star instead of Lemoine star...). 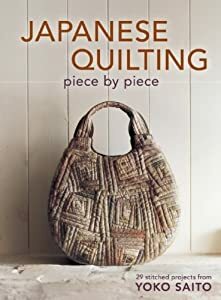 If you like to make quilted bags and other unique gifts, this book by a Japanese seasoned quilter is a must-have for your quilt library!